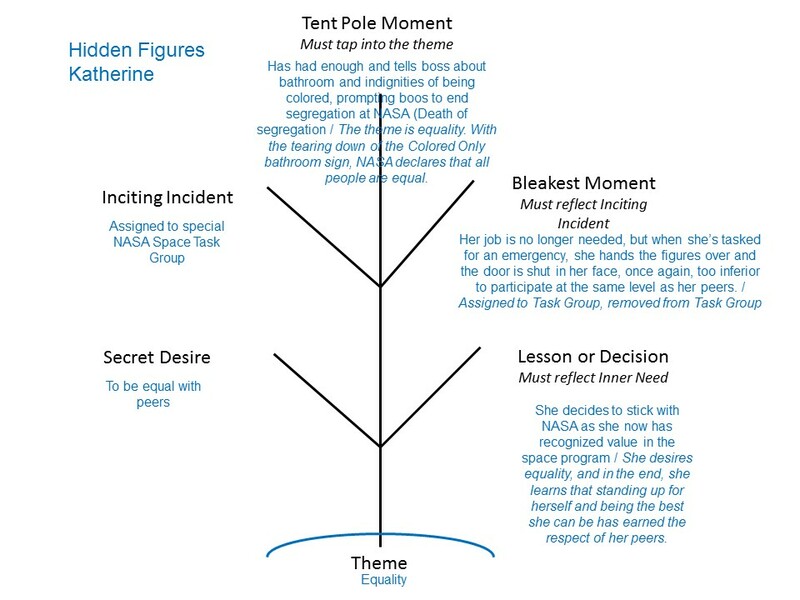 The following is a breakdown of Hidden Figures following the character of Katherine. SECRET DESIRE: To be accepted in the world in which she lives. INCITING INCIDENT: NASA assigns her to the Space Task Group. TENT POLE MOMENT: Tells everyone about the bathroom and the indignities of being colored. DEATH IN THE MIDDLE: After her eruption, her boss, Al Harrison, finally gets it and ends the segregation in his department, declaring, "Here at NASA, we all pee the same color." Thus, it's the death of segregation. CONNECTING TENT POLE WITH THEME: The theme is equality. With the tearing down of the Colored Only bathroom sign, NASA declares that all people are equal. BLEAKEST MOMENT: Now that Friendship 7 is about to launch, Katherine's job is no longer needed. But a problem arises and she ultimately saves the mission, but when she hands the book with the correct figures needed to launch to her advocate, Al Harrison, he quickly takes it, then shuts the door to the control room in her face. Once again she's considered too inferior to participate at the same level as her peers. 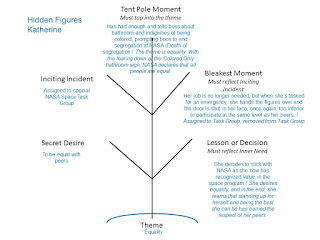 CONNECTING BLEAKEST MOMENT WITH INCITING INCIDENT: She had been promoted to the Space Task Group, but now it has ended with no more acceptance than she'd had at the beginning. CONNECTING THE LESSON WITH THE SECRET DESIRE: She desires equality, and in the end, she learns that standing up for herself and being the best she can be has earned the respect of her peers.